Editor’s Note: I’ve decided to begin posting some reviews of films screening at Hot Docs 2009 early, hopefully helping anyone attending make some decisions about what to see. Big River Man is screening on Thursday May 7 at 7:00pm at the Isabel Bader Theatre and Saturday May 9 at 6:30pm at the Bloor Cinema. 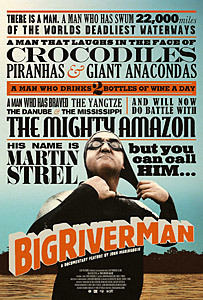 Big River Man (Director: John Maringouin): Martin Strel is no Michael Phelps. The Slovenian endurance swimmer is 53 years old, for starters. He’s also fat and drinks two bottles of wine a day. But remarkably, over the past ten years he’s swum some of the longest rivers in the world, including the Mississippi, the Danube, and the Yangtze. At the beginning of Big River Man, he’s preparing for his biggest challenge yet, to swim the entire length of the mighty Amazon river; he’ll be taking time off from his day job as, believe it or not, a flamenco guitar teacher and bringing along his friend and amateur river guide, a professional gambler from Wisconsin. Though the Amazon swim is ostensibly undertaken as a charity project “to protect the rain forest,” it soon becomes clear that there is no real substance behind this justification. Instead, the simple fact is that endurance swimming is both an obsession and a kind of therapy for Strel. Well, Strel never really says that. In fact, he rarely says much of anything. The entire film is narrated by his son Borut, his assistant, publicist and manager all rolled into one. Borut seems like a completely normal fellow, except for his strange habit of speaking not only for his father, but in interviews with the media, as Martin. He justifies it by saying that he knows what kind of stories the media want. By the end of the film, though, I suspected that Borut narrates Martin’s story even when there are no cameras or microphones around. For such a mild-mannered lad, he has an incredible ability to spin mythology out of his father’s rather simple pursuit. He tells us, for instance, that as a child, his father was beaten mercilessly by his own father and that his first long-distance swim in a river was actually an attempt to escape a beating. For Martin Strel, it seems, swimming the world’s great rivers is a way to exorcise his demons. Except that in the course of a 66-day swim, he seems to stir up more demons than he banishes. As if dealing with dangerous currents, piranhas, parasites and the blistering sun weren’t enough, Martin begins losing his mind, even as his doctor begs him to abandon the swim before his heart gives out or he has a stroke. Strel presses on and the film enters surreal territory. I was reminded of Joseph Conrad’s Heart of Darkness, Herzog’s Fitzcarraldo and a whole host of other explorations of madness and the jungle. Director Maringouin uses music, sound and editing to great effect to convey Strel’s mental state. On several occasions, Strel swims away from the boat without notifying anyone, and on one occasion, Borut has to sweep the nighttime horizon with floodlights looking for his father. As we watch this very private man go ever deeper into himself, we wonder not just if he’ll finish the swim, but whether he’ll recover his sanity. By Day 63, even Borut is referring to him as a monster and comparing him to the Elephant Man. Strel is a man of tremendous appetites and drive and is a fascinating character no matter how you look at him. However, the fact that the whole story is told by his son Borut immediately made me uneasy. When it’s combined with Maringouin’s manipulative (though highly accomplished) filmmaking, I’m left with a strange feeling of being slightly had. It’s almost as if the physical accomplishment of the Amazon swim is pushed into the background by both Borut and the director so that we can focus on the madness instead. While the mythology makes for a better film, I almost feel like it disrespects the man a little bit. Make no mistake, though: this is a must-see. P.S. To add even more to the surreality, the film was executive produced by Olivia Newton John. Yes, really. This entry was posted in Documentaries, Film Festivals, Hot Docs and tagged #hotdocs09, amazon, endurance, slovenia, sports, swimming. Bookmark the permalink. Sounds like a fun film. Two bottles of wine per day? Wow! This guy sounds like quite the character. BTW, that is a stunning poster for the film. Jay, the poster was designed by UK-based All City Media, who have plenty more stunning posters in their portfolio. I could spend hours at their site!